A fragment of Amelia Earhart's lost aircraft has been identified to a high degree of certainty for the first time ever since her plane vanished over the Pacific Ocean on July 2, 1937, in a record attempt to fly around the world at the equator. New research strongly suggests that a piece of aluminum aircraft debris recovered in 1991 from Nikumaroro, an uninhabited atoll in the southwestern Pacific republic of Kiribati, does belong to Earhart's twin-engined Lockheed Electra. "The Miami Patch was an expedient field repair," Ric Gillespie, executive director of TIGHAR, told Discovery News. "Its complex fingerprint of dimensions, proportions, materials and rivet patterns was as unique to Earhart's Electra as a fingerprint is to an individual." The rivet pattern and other features on the 19-inch-wide by 23-inch-long Nikumaroro artifact matched the patch and lined up with the structural components of the Lockheed Electra. TIGHAR detailed the finding in a report on its website. "This is the first time an artifact found on Nikumaroro has been shown to have a direct link to Amelia Earhart," Gillespie said. The breakthrough would prove that, contrary to what was generally believed, Earhart and her navigator, Fred Noonan, did not crash in the Pacific Ocean, running out of fuel somewhere near their target destination of Howland Island. Instead, they made a forced landing on Nikumaroro' smooth, flat coral reef. The two became castaways and eventually died on the atoll, which is some 350 miles southeast of Howland Island. In 10 archaeological expeditions to Nikumaroro, Gillespie and his team uncovered a number of artifacts which, combined with archival research, provide strong circumstantial evidence for a castaway presence. "Earhart sent radio distress calls for at least five nights before the Electra was washed into the ocean by rising tides and surf," Gillespie said. Previous research on a photograph of Nikumaroro's western shoreline taken three months after Earhart's disappearance revealed an unexplained object protruding from the water on the fringing reef. Forensic imaging analyses of the photo suggested that the shape and dimension of the object are consistent with the landing gear of a Lockheed Electra. The object rests at a depth of 600 feet at the base of a cliff just offshore where, according to TIGHAR, the Electra was washed into the ocean. An analysis of the anomaly by Ocean Imaging Consultants, Inc. of Honolulu, experts in post-processing sonar data, revealed the anomaly to be the right size and shape to be the fuselage of Earhart's aircraft. The new research on Artifact 2-2-V-1 may reinforce the possibility that the anomaly is the rest of the aircraft. 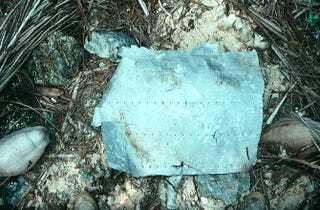 "The many fractures, tears, dents and gouges found on this battered sheet of aluminum may be important clues to the fate and resting place of the Electra," Gillespie said. In June 2015, TIGHAR will return to Nikumaroro to investigate the anomaly with Remote Operated Vehicle (ROV) technology supported by Nai'a, a 120-foot Fiji-based vessel that has served five previous TIGHAR explorations. During the 24-day expedition, divers will search for other wreckage at shallower depths and an onshore search team will seek to identify objects detected in historical photographs that may be relics of an initial survival camp. "Funding is being sought, in part, from individuals who will make a substantial contribution in return for a place on the expedition team," Gillespie said. This post originally appeared at DNews. It has been republished with permission.